Vintage delivery lorry on a 1943 billhead from Walter Brown & Son, Crewe. Homepage. This page: Agricultural supplies are delivered by a vintage-era flatbed lorry. Walter Brown & Son, Crewe. Not all the old items of paperwork featured in this corner of the site relate to garages. A few, like the one shown below, were issued by a business un-related to the world of motoring, but happen to feature an illustration of a works' vehicle upon it. Here, a smart 1920s-era 'C' cab delivery lorry is portrayed, making deliveries on behalf of Walter Brown & Son, of North Western Mills in Crewe. The customer was a Mr Ashton, of Brockhurst, near Wem in Shopshire. The invoice dates to the war years - specifically March 1943 - so clearly Walter Brown was able to keep his delivery vehicle(s) on the road during strict petrol rationing, presumably being classed as "essential use". The vehicle dates to the vintage era though, with its exposed driving position - very 1920s, if not earlier. The artwork is to a high standard, it's a shame that there are few records surviving that credit such artwork to the people responsible for their creation. The heading refers to the Fertilisers and Feeding Stuffs Act of 1926, making the design of invoice heading a creation of the mid/late 1920s at the earliest. Walter Brown & Son registered as a Private Limited Company just a few months after this invoice was raised, in July 1943, and continues to be listed as an Active company. 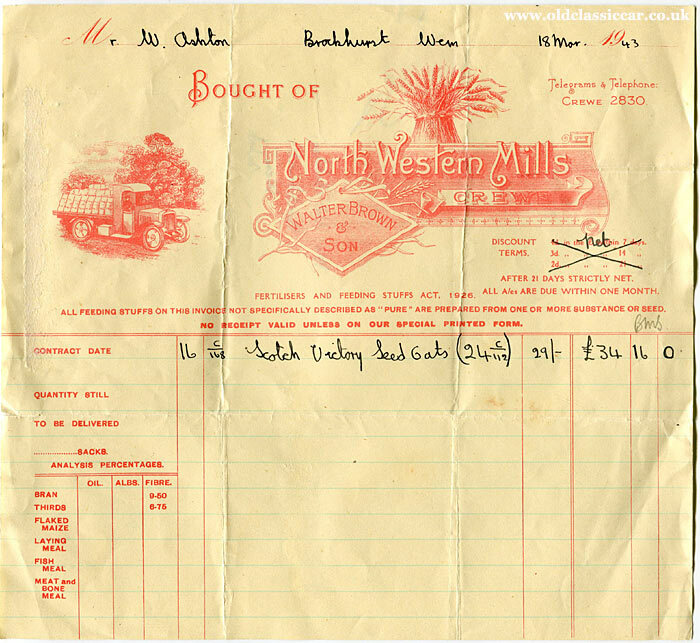 And what of North Western Mills in Crewe? This is now the home of Morning Foods, producers of Mornflake breakfast cereals and a company that can trace its milling roots back to 1675. Prior to posting the invoice, it was folded several times, and Mr Ashton's address was written on the reverse side. A one-pence (1d) Penny Red stamp was used. Return to the Motoring Collectables section, where many other garage-related items may be found.